The Sisters of the Holy Names of Jesus and Mary undertook the daunting task of opening a mission in Seattle, WA in the fall of 1880. Reverend F. X. Prefontaine, pastor of the Church of Our Lady of Good Help in Seattle, had long urged the Sisters to establish a school in the city, which attracted a rough crowd that quickly gave the city a reputation for prostitution, gambling and drunkenness. Local government was ineffective, basic services were lacking and few educational opportunities existed. It was hoped the Sisters’ presence in Seattle would serve as a stabilizing influence. By 1883, Holy Names Academy had outgrown its original location. The Sisters sold the property and bought a block in Maynard’s Addition, between King and Jackson Streets for $9,850 in gold coin. Unforeseen expenses, delays and a fire in the partially completed building caused great anxiety, but the new school opened in the fall of 1884 to the Sisters’ great joy. Classes began with 30 day pupils and five boarders. In 1888, the Holy Names congregation agreed to accept a new mission in Spokane Falls in eastern Washington. The Northern Pacific Railroad had arrived in 1881 and became part of the transcontinental rail system in 1883. This, along with the discovery of gold in the Coeur d’Alene mining district, transformed Spokane Falls into the center of regional commerce. A small group of Sisters left Portland to start a school in Spokane, known as Our Lady of Lourdes. It opened with 58 girls and 44 boys. Enrollment for the first year eventually reached 302. The year of 1889 was filled with trials for the Sisters working in Washington. At Our Lady of Lourdes, an outbreak of typhoid fever afflicted both students and teachers. The school was closed to prevent further spread of the disease. On April 19, the disease claimed the life of Sister Mary Cassilda. That summer, devastating fires occurred in Seattle and Spokane Falls. The Sisters at Holy Names Academy in Seattle watched in horror as large sections of the city disappeared right before their eyes. Two months later, Spokane suffered significant damage from a fire downtown. When the blaze reached the block next to the convent, a priest placed the ribbon of St Amable on the sidewalk between the building and the flames. The wind changed immediately. The Sisters added Holy Names Academy on the suburban east side of the Spokane River in 1890, and four years later, Sisters were sent to Sacred Heart School in Seattle. Among other challenges, an outbreak of scarlet fever forced Sacred Heart to close for the final month of the term in 1894. In 1901, Holy Names Sisters opened St. Rose’s Academy on Broadway and Madison in Seattle. Enrollment was promising the first several years, but the opening of Immaculate Conception School and declining commercial operations in the neighborhood resulted in the Provincial Council’s decision to close the school in 1911. However, 1907 proved to be a banner year for the Holy Names Sisters. With the growth of Holy Names Academy, construction of a new building in Capitol Hill commenced that year. At about the same time, a dream came true for the Oregon Province – two Normal Schools opened at Holy Names Academy in Seattle and Spokane for the benefit of young Sisters as well as lay women who wished to enter the teaching profession. A state occasion occurred the following year with the opening of Holy Names Academy at its new location on Capitol Hill. Mother Martin of the Ascension, Superior General of the congregation, came from Montreal, Canada, for the dedication. Then in 1911, the Sisters founded the Cathedral School in which they would minister for many decades to come. Classes were begun in the former St. Rose’s Academy until the new Cathedral school building was completed the following year. The Sisters’ chronicles testify to their concerns about global crisis as World War I engulfed Europe. Closer to home, there were other dangers: After the winter of 1916 brought record snowfall to Seattle, the dome of St. James Cathedral collapsed just hours after the Sisters had knelt under it for Mass. The war years witnessed the opening of two new schools in Spokane. St. Patrick’s School opened in Hillyard in 1914 and in 1916, St. Aloysius School was founded and operated at Holy Names Academy before moving to its own site two years later. The Sisters at St. Aloysius joined in the nation’s heartfelt joy when the armistice was signed in November 1918, signaling the end of four long years of bloodshed. The Sisters hoped the war’s end would bring about a return to normalcy but across the globe, a new horror was unfolding as the influenza epidemic of 1918-1919 infected one-fifth of the world’s population. The flu was most deadly for people ages 15 to 40 and thus posed a serious threat to the health of many of the Sisters as well as their older students. At Sacred Heart Academy, Sister Mary Isidorita contracted the disease but slowly recovered after many prayers and much anxiety in the community. The 1920s proved to be a tumultuous decade for the Holy Names Sisters working in the Pacific Northwest. In November 1922, a ballot initiative in the state of Oregon sought to compel children between the ages of 8 and 16 to attend public schools. Proponents, most notably the Ku Klux Klan and the Federation of Patriotic Societies, believed that the measure was necessary to preserve homogeneous American culture. Opponents argued that the measure not only violated constitutionally guaranteed property rights but also posed a threat to religious freedom and the ability of parents to educate their children in accordance with their religious beliefs. Although voters approved the initiative, it was challenged in court with the Society of the Sisters of the Holy Names of Jesus and Mary as the main plaintiff. The Sisters prevailed when the U.S. Supreme Court ruled in their favor in 1925. In 1923, the Holy Names community agreed to staff two additional schools in Seattle: St. Mary’s Parish and St. Anne’s School in the Queen Anne neighborhood. The Sisters established the first four-year women’s college in the Spokane region in 1938. Holy Names College stood across the street from the Academy until the Sisters acquired Fort George Wright, a former military base along the Spokane River and renamed it Fort Wright College of the Holy Names in 1963. Five years later, construction of the Holy Names Convent was completed on 57 forested acres along the Spokane River. The convent’s midcentury modern design won several prestigious architecture awards. A few years after graduating their last class, the Sisters sold the Fort Wright College property to Mukogawa Women’s University in 1990, strengthening a bond of friendship with the Japanese educational community. The Sisters retained the Holy Names Music Center on the site; music classes are still taught there today. 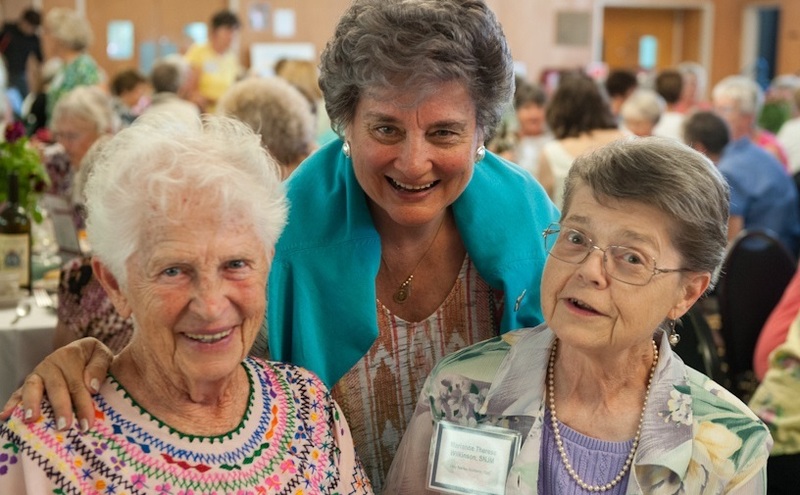 In 2013, Holy Names alumni, family and friends received letters sharing the news that the Sisters would move from the Convent of the Holy Names to senior living facilities elsewhere in Spokane. Catholic Charities Spokane was selected to purchase the Convent buildings and a portion of the surrounding property, which the organization has repurposed for social services programs and affordable housing serving people experiencing hardship and homelessness. The remaining 31 acres of property, including the beautiful and pristine Spokane River frontage, was acquired by the Spokane County Conservation Futures program for perpetual preservation.